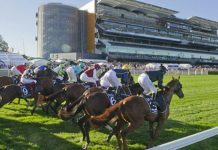 RANDWICK REVIEW – SATURDAY FEBRUARY 27 2016 Race 1 – ALL TOO HARD HANDICAP (2400m) 1st LORD DISICK – Christian Reith 2nd DEE I CEE – Thomas Hewitt 3rd ANOTHER COCKTAIL – James McDonald Springbok Flyer flew out of the gate from out wide with Berry intent on leading, with Mr Steal on the fence also being pushed through, Dee I Cee trailing Springbok Flyer and Lord Disick also keeping touch. Berry claimed the lead he was after into the first turn and set a hot pace doing so, Avdulla going with him on Mr Steal as they opened up lengths on Dee I See, likewise again to Lord Disick, and the remaining runners in a race of their own back further again. Toward the back of the course and Berry attempted to take the foot off somewhat, with Avdulla doing the complete opposite – taking off on Mr Steal at the 1400 to string the field out even further. By the 1000 Mr Steal was about by six lengths to Springbok Flyer, who was caught by Dee I See and Lord Disick who were not interested in trying to go with the leader yet. They still had four lengths on the trailing pack. Round the last turn and Mr Steal’s lead was down to four lengths as he looked to be tiring already – the rest of the field largely bunching into the straight aside from Archean, who was well back and not getting involved. Mr Steal stopped as Dee I See and Lord Disick eased past him and looked to battle to the line. Tough runs from both but Lord Disick had too much, edging Dee I See, with Another Cocktail running on best of the rest. Watch: none. Race 2 – PRO-RIDE SKYLINE STAKES (1200m) 1st GOOD STANDING – Hugh Bowman 2nd LIONHEARTED – Christian Reith 3rd SOUCHEZ – William Buick Lionhearted jumped best along with Good Standing on the fence and Military Machine, with Hayman on the inside, but it was Souchez pushing through to join the leader. McDonald was caught reasonably deep on Telperion and immediately took him back to trail the field and stalk them patiently. Reith hugged the rail on Lionhearted around the turn with Souchez still wide, as Good Standing came up between them as they straightened. Souchez fell away in the straight and left it to the other two, as McDonald had gone wide on Telperion to try to swoop, but his mount didn’t have a shot to fire. Good Standing put the pressure on Lionhearted and was too good, drawing away for a solid win. Watch: none Race 3 – TAB HIGHWAY PLATE (1600m) 1st APPOINT PERCY – Brenton Avdulla 2nd WARKEN – Lester Grace (a2/52kg) 3rd DESTINED TO WIN – Sam Clipperton Coolcat Dancer was first out with Warken and Appoint Percy also starting well, whilst at the other end Loyal Toast missed it to fall out last. Agrionus was also up on the speed early, with Destined to Win and Swivet handy. Jennings gave Coolcat Dancer his head and raced away by a couple of lengths down the side of the course from Warken and Appoint Percy, with a couple more to Destined to Win, Agrionius and Swivet. Appoint Percy and Warken made up the gap as they straightened, the former looking a good thing as he strode up to Coolcat Dancer with little encouragement from Avdulla. The pacesetter battled manfully, if briefly, before Avdulla called on his charge and moved away. Warken and Destined to Win also ran past Coolcat Dancer, but never threatened the leader. Watch: none. Race 4 – LES JOHNSON MEMORIAL SWEET EMBRACE STAKES (1200m) 1st SCARLETT RAIN – Kathy O’Hara 2nd IN THE VANGUARD – Brenton Avdulla 3rd TALE OF CHOICE – Kerrin McEvoy Hot favourite Scarlett Rain was coming from the outside gate and the plan was clearly to boot her forward, things going very smoothly as she exploded out of the gates to come straight across and to the front. She had some competition from In The Vanguard and Tale Of Choice, who trod a similar path, McEvoy on Tale Of Choice electing to stay a little wider outside the leader. Our Belisa and Kentucky Miss were not far off, followed by Smart Amelia, Sugarparma and Twist Tops, both caught wide in a very bunched field. Clipperton on Sugarparma attempted to improve his lot as they headed around the side, going out very wide to move up, as Scarlett Rain continued to hold sway on the fence and looked relaxed as they straightened. Tail Of Choice was just off the shoulder, whilst In The Vanguard was caught narrow behind the leader and frustrated for a run. Sugarparma and eventually Twist Tops were threats from deep, but didn’t materialise. 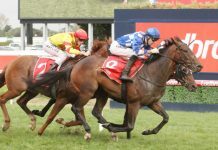 O’Hara released Scarlett Rain as required and ran on for a comfortable win, with the order remaining the same for much of the race as the leaders claimed the places. Twist Tops eventually got going too late, but hit the line well. 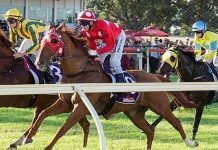 Watch: Scarlett Rain, Twist Tops – the winner looked classy leading all the way, whilst Twist Tops remains in good form and hit the line fast. Race 5 – COOLMORE SURROUND STAKES (1400m) 1st GHISONI – James McDonald 2nd SINGLE GAZE – Kathy O’Hara 3rd STAY WITH ME – Kerrin McEvoy Fairly even start apart from Ambience, who missed it completely. Captured initially jumped best, but was quickly claimed by Single Gaze who in turn gave it up for the hot favourite Ghisoni, McDonald shoving him forward intent on the lead. He sat on the inside and a head in front of Single Gaze as the pair tracked at a fairly pedestrian speed, with Heartlings also on the inside behind the leader and flanked by Pearls, with Captured caught wider again. Also wide and further back was Stay With Me, with McEvoy pushing up and attempting to improve position. A bit of jostling around the turn – but not at the front, as McDonald remained statuesque on the leader with Single Gaze content on his shoulder. Pearls was hard ridden into the straight, as was Heartlings camped on the rail, and O’Hara in turn pulled the trigger on Single Gaze. Ghisoni continued to cruise and had it won at the 100 metre mark, McDonald only asking minor questions, with Stay With Me running on best to hit the line. Watch: Ghisoni, Stay With Me – McDonald barely woke the winner, whilst Stay With Me had to do a bit of work but still finished strongly. Race 6 – GUY WALTER STAKES (1400m) 1st SOLICIT – Kerrin McEvoy 2nd ZANBAGH – Kathy O’Hara 3rd PEEPING – Sam Clipperton Vergara was first out of the gates, with hot favourite Solicit rushing on to quickly take the lead with Peeping handy on the fence and Amicus moving up from deep to join in. Behind Peeping was Mahara and Adorabeel with Tinto caught wide, and then a length to Zanbagh. 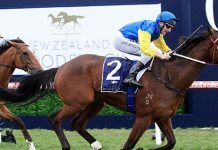 McEvoy continued to push Amicus into the turn and moved up on Solicit’s outside, with McDonald content to sit behind them on Vergara, allowing Peeping and Tinto to join him. McEvoy remained in control as they straightened, whilst Bowman was all arms and legs and he tried in vain to keep Amicus in the race. Outside was Peeping who kicked on to quickly claim Amicus, and it was Zanbagh wider again who came hardest to finish the race the best of the challengers. McEvoy could wait until late before pulling Solicit into gear, never challenged as he cruised over the line with plenty left in the tank. Watch: Solicit, Zanbagh. The winner was a class above, and Zanbagh showed impressive speed late. Race 7 – PRECISE AIR CHIPPING NORTON STAKES (1600m) 1st WINX – Hugh Bowman 2nd DIBAYANI – Blake Shinn 3rd HAURAKI – Sam Clipperton To the Group 1 and somewhat of a staggered start, Dibayani bouncing out first whilst Hauraki missed it to trail the pack immediately. Mongolian Khan was right behind Dibayani, as was Hartnell, before Buick had Magic Hurricane racing up the outside to claim them all and push to the front. Storm The Stars and Preferement were behind the leaders, with a slight gap to Gust Of Wind and the star attraction Winx, whilst further back Hauraki had quickly caught up and passed a few. Moderate pace as they started to round the side of the course, Magic Hurricane keeping up the speed whilst McDonald jostled a little on Hartnell as the field spaced. 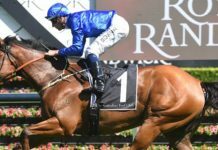 At about the 600m they bunch again slightly and Bowman got Winx moving, swinging her around the outside to corner widest, while Clipperton shadowed their every move into the straight. Dibayani fought the hardest and went with the champion for a few strides, but there would be no denying the inevitable as Winx kept lifting and lifting to dispatch her rival and claim her seventh straight win. Hauraki kept following to run third. Watch: Winx, not that it needs to be stated. 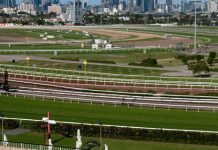 Race 8 – LIVERPOOL CITY CUP (1300m) 1st CHARLIE BOY – Blake Shinn 2nd ROCK STURDY – Jason Collett 3rd GOOD PROJECT – Hugh Bowman Fast start and battle for the lead with Rich Enuff claiming it from Charlie Boy, who had the rails run, River Lad outside of him and Big Money not far away. Generalife was next with Famous Seamus and Weary caught deep outside it, from It’s Somewhat, Good Project and Rock Sturdy. Little movement around the turn until they straightened, as they fanned out with the backmarkers looking for a run. Collett on Rock Sturdy was most active, ducking and diving as he eventually found some clear air wide to lay down a challenge. He was matched for a run by Good Project, both storming down the outside to put the heat on a faltering Rich Enuff. Meanwhile Charlie Boy had stalked the leader down the straight from the rails, waiting patiently for a run, finally getting it and duly claiming Rich Enuff, going on for victory over the fast finishing pair on the outside. Watch: Rock Sturdy – showed solid speed once clear air was found. Race 9 – SCHWEPPES HANDICAP (1200m) 1st MEURSAULT – James McDonald 2nd MY FAVORITE – Hugh Bowman 3rd NANCY – Kerrin McEvoy Mixed strategies at the start, Maursault and My Favorite pushing forward for the lead with others laying back, noticeably Bold Circle and Unequivocal, who drifted all the way back and made his way across. El Sasso sat just off the leaders but was caught a little wide, Danish Twist having the inside going from Typhoon Jolly, Dragon Flyer and Nancy. Bowman controlled the lead on the inside around the turn on My Favorite, with Meursault stalking his every stride. Further back and making the run at the top of the straight was Nancy, though it quickly became a race in two as the leaders pulled away for a match race to the line. My Favorite briefly looked the stronger and headed his rival, before Meursault fought back to claim a thrilling win after he looked to have run his race. Nancy claimed third from a very fast finishing Unequivocal storming down the outside. Watch: none Horses to follow: Twist Tops, Stay With Me, Solicit, Winx, Ghisoni. —– CAULFIELD REVIEW Race 1: Mornington Cup Prelude (2000m) 1st Assign – Nick Hall 2nd Wexford Town – Michelle Payne 3rd Extra Zero – Mark Zahra Koroibete blew the start by four and settled last. Nobody super keen to lead, Wexford Town, Assign, Kareeming, Tuscan Fireand Bonfire were all up there until Assign ran to the front. Tashbeeh and Radical were behind that bunch. Once they sorted themselves out Assign had a soft lead from Kareeming with Wexford Town dropping in for a trail inside Tuscan Fire. Bonfire was trapped three wide and was forced to stay there. Assign stacked them up and when he sprinted near the 600m they were all off the bit chasing him. Kareeming cracked immediately, as did Bonfire while Wexford Town followed the leader through. Tashbeeh made his move wider out and Extra Zero went with him, though had a shove from Manndawi on the turn and lost a bit of ground. Assign was off and gone at the 300m, Tashbeeh peaked on his run soon after that and Wexford Town ran past him, Extra Zero was still running on down the outside and Radical poked up on the fence. Assign had the race won 800m out and cruised home from his stablemate Wexford Town who was solid first-up and Extra Zero ran into another placing. Tashbeeh may have come to the end of his preparation, he was entitled to run second with the run he had. Radical ran a better race and Manndawi was fair. Follow: while he had an easy run it’s hard to knock Assign, who is on the up. Race 2: Zeditave Stakes (1200m) 1st Santa Ana Lane – Ben Melham 2nd Brockhoff – Damien Oliver 3rd Bassett – Daniel Stackhouse Bassett jumped best and went forward with Tuscany Hero to share the early lead. Well Sprung landed behind them and Santa Ana Lane also found a good spot. Odyssey Moon was trapped wide around them and Brockhoff raced a bit hard in between. El Greco sat three back on the fence. Tuscany Hero eventually crossed to the fence and Bassett sat up outside. Odyssey Moon was having no luck while Well Sprung kept the box seat. Santa Ana Lane stayed on Bassett’s back while Brockhoff was tracking Odyssey Moon and in turn Mogador was on his back. Bassett regained the lead at the 200m and Odyssey Moon was still chasing despite a wide run, and he held Santa Ana Lane in for a while. Brockhoff was unwinding town the outside. Bassett gave a kick and looked to be holding them but they were closing on him late and Santa Ana Lane stuck his head out to score a game first-up win from Brockhoff lunging late. Bassett held third while Odyssey Moon was very brave just behind them and Puritanfinished strongly from last. Well Sprung had his chance and Mogador was a bit plain. Follow: Plenty but the best two runs were the first two in Santa Ana Lane who still has improvement, Brockhoff was excellent. Race 3: Angus Armanasco Stakes (1400m) 1st Catch A Fire – Damian Lane 2nd Mossin’ Around – Mark Zahra 3rd Pasadena Girl – Luke Nolen Mossin’ Around and Cana were the best to begin and the latter found the lead. Catch A Fire worked over around Smokin’ Bellaand Purrpussful. Let Her Rip raced in the clear a couple back while Pasadena Girl and Egypt were around midfield as they strung out a bit. Catch A Fire eventually made it up outside Cana but did some work and they broke away from Mossin’ Around. Smokin’ Bella stayed on her back with Purrpussful while Egypt worked up behind them. The leaders backed off for a couple of furlongs before the turn and just as it looked they were being reeled in Catch A Fire sailed past Cana and went for home. Mossin’ Around and Smokin’ Bella were looming and Pasadena Girl started to look ominous down the outside. Egypt was bailed away with nowhere to go and went to the line untested. Catch A Fire put a few lengths on the chasers and proved far too good. About nine of them in a bunch behind her, Mossin’ Around kept fighting on for second and Pasadena Girl peaked on her run but managed third. Purrpussful and Cana were just behind her and making ground out wide from the back was Alaskan Rose. As mentioned Egypt had no luck, total forgive run. Not sure about the form here, the winner was up from a maiden, though had performed in group races in the spring, and the others were in a bunch. Follow: none in particular. 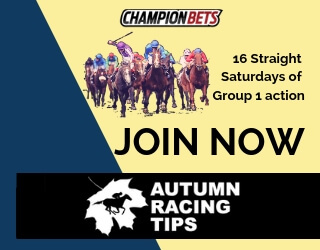 Race 4: Autumn Classic (1800m) 1st Tally – Craig Williams 2nd Flying Light – Damian Lane 3rd Top Ravine – Michael Dee Took some 400m to sort themselves out and Hoplites ran to the lead over Top Ravine who worked across from out wide. Flying Light dropped in behind and Celtic Tiger was trapped out around Tally and Prior Engagement. Patch Adams wanted to over race early on and Ayers Rock was similar outside him, and much further back than normal. No real change until near the home turn when Tally pulled out four wide to put himself in the race. Top Ravine hit the lead at the 300m from Hoplites but Tally descended on them quickly. Flying Light just had to wait for Tally to go before switching across heels and they beat off Celtic Tiger. Tally asserted his authority in the latter stages and won comfortably over Flying Light getting up for second over Top Ravine, brave after working, and they were clear of the rest headed by Patch Adams. Another decent gap to the others, of thoseCharlevoix made a bit of late ground in not a bad run straight out of a maiden. Follow: Tally is progressive but these are the second and third level three-year-olds. Race 5: Peter Young Stakes (1800m) 1st Bow Creek – Damien Oliver 2nd Fenway – Mark Zahra 3rd Mourinho – Craig Newitt Bow Creek scrambled out and was a clear last before improving along the inside to about midfield. Messene found the lead overMourinho getting up outside him. Awesome Rock had to work hard up the hill to be handy and Fenway landed in a nice spot.Our Ivanhowe settled on her back with Lidari and Happy Trails while He Or She was midfield in the clear. Mourinho took over in the middle stages and that allowed Awesome Rock to move to second while Lidari found himself three wide and having to go forward. In that shuffle Fenway came off the fence to sit outside Messene. Coming to the turn Our Ivanhowe came off the inside and that allowed Bow Creek to sneak through to be three back on the fence. Mourinho and Awesome Rock were battling it out at the 200m and Fenway had worked to the outside of them to run on, meanwhile Bow Creek switched back inside the leaders. Our Ivanhowe was held up and had to follow Bow Creek through. Bow Creek took that inside run and sprinted very sharply, putting a couple of lengths on them in the space of 100m. Devastating performance. Fenway finished on for second but was no match and Mourinho held off a very brave Awesome Rock for third. Our Ivanhowe didn’t have much luck winding up just behind them and Rising Romance was the eye-catcher from the back after she was also held up at a vital stage. Flops from Happy Trails and Fawkner, the latter was never in the race. Follow: can’t knock the winner, Our Ivanhowe and Rising Romance were excellent too. Race 6: Group 1 Futurity Stakes (1400m) 1st Turn Me Loose – Opie Bosson 2nd Stratum Star – Mark Zahra 3rd Suavito – Luke Currie The United States missed it by about a length but had no speed and found himself about four off the pack. Stratum Starshowed out first before Hucklebuck fired up and took over. Suavito was up handy and Turn Me Loose worked up into second with Trust In A Gust caught wide and pressing on past him. Scissor Kick and Boban settled midfield with Entirely Platinum a lot further back than usual. Hucklebuck burned for a couple of furlongs in the middle section and by the time he reached the turn he was a shock duck and Trust In A Gust, also under pressure, went past at the 300m. Turn Me Loose and Stratum Star started their runs and they were a couple clear of Suavito. Rebel Dane made a dash at them too and The United States was also running on strongly. Turn Me Loose had about a length advantage on Stratum Star over the last 100m and held that margin safely. Suavito warmed up well late and Rebel Dane’s run ended but he held on next just ahead of The United States. Trust In A Gust was gassed by Hucklebuck, not sure what he was doing in front, and the others were unsighted. Boban bled for the second time and is now banned in Australia. Follow: there were nice runs behind him but you’d want to stick with Turn Me Loose. Race 7: Group 1 Blue Diamond Stakes (1200m) 1st Extreme Choice – Craig Newitt 2nd Flying Artie – Damien Oliver 3rd Zamzam – Nick Hall Highland Beat and Areti went looking for the lead from their wide gates and Hey Doc held his spot towards the inside and they led from Valliano easing. Extreme Choice jumped well then was taken hold of to be just behind them. In the bunch next wereMiss Nymeria, Hell Of An Effort, Samara Dancer, Sweet Sherry and Star Turn. Concealer was well back on the inside ofZamzam. Flying Artie went right back, not helped by a check in the early stages. Areti was the first horse beaten before the turn and Extreme Choice made a move to be challenging and he hit the lead quickly from Highland Beat and Hey Doc. Miss Nymeria was in the clear in plenty of time. Flying Artie was speared off the track on the turn but he balanced up and started to charge from the 300m out wide. Back in the ruck Samara Dancer and Concealer were doing little. Extreme Choice went for home and had a good break over Flying Artie running on hard and the others were in a race of their own. Extreme Choice held Flying Artie comfortably in the last 100m in a dominant win. Good effort from the second horse after getting no favours. About four lengths back Zamzam worked through the pack into third ahead of Power Trip but they weren’t in the same race. Follow: Extreme Choice and Flying Artie could be competitive in the Golden Slipper. Race 8: Group 1 Oakleigh Plate (1100m) 1st Flamberge – Damian Lane 2nd Fell Swoop – Glyn Schofield 3rd Heatherly – Katelyn Mallyon Kuro and Flamberge broke best but the speedy Heatherly booted through underneath to hold the lead. Keen Array was right behind them with Fell Swoop in that bunch and Gregers on the fence. Atmospherical and Bounding were on the back of them and Dothraki was trapped out from his outside alley. Midfield Griante was getting along the fence inside Fast ‘N’ Rocking andPittsburgh Flyer. Heatherly skipped away around the turn and Gregers followed her through. Kuro and Keen Array were flat while Flamberge was winding up in the middle of the track. Fell Swoop couldn’t get a crack at them and Griante was also climbing over backs. Pittsburgh Flyer was getting through inside Bounding, who didn’t sprint, and Dothraki with Reldas winding up out wide. Heatherly still had it at the 100m until Flamberge ran her down and he just held off a flying Fell Swoop to win. Heatherly was gallant and Pittsburgh Flyer ran a very nice race first-up. Reldas charged late as he always does and The Quarterback also produced his customary later finish from last. Of the others Dothraki ran well but had no favours, Gregers had every chance and Bounding disappointed. Good win by Flamberge with top weight and a wide alley but Fell Swoop should have cantered in. Follow: Fell Swoop heads to the Galaxy and will take beating. Race 9: Mannerism Stakes (1400m) 1st Azkadellia – Damien Oliver 2nd Tuscan Sling – Brad Rawiller 3rd Miss Rose De Lago – Opie Bosson Choose bounced in front but handed up to Miss Rose De Lago and Fast Approaching who crossed over. Wawail took a trail behind them with My Sister Lil on the fence and Tuscan Sling in the clear. Anaphora and Distant Dreams were the next pair while Azkadellia was three deep among the last few. Miss Rose De Lago was able to control things in front as Fast Approaching stayed about a length away. Wawail eased out to creep forward before the turn and Tuscan Sling had her back. Choose had the leader’s back but looked in trouble a fair way out. Azkadellia pulled the widest on the turn. Miss Rose De Lago had a couple of cheap sectionals midrace and kicked into the straight. Tuscan Sling ran past Wawail with Azkadellia another length or so back and winding up. My Sister Lil was still there and Choose couldn’t match them. Just as Tuscan Sling stuck her head in front Azkadellia charged and while the margin was only a head or so it looked a bit soft on the line. Miss Rose De Lago ran well though had favours and My Sister Lil just missed out. From the back Anaphora made some ground without being a threat. 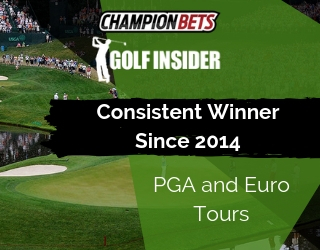 Follow: stick with Azkadellia who will be competitive in Sydney. Specials from the meeting: Brockhoff, Our Ivanhowe, Fell Swoop.